After all the work I'd done on the boat I still had not touched the bottom since I bought her. I knew she needed bottom paint and some thru-hulls replaced and I suspected there where a few blisters to repair in addition to the 'Catalina Smile'. I wanted to wait until I was done working at BEA before I hauled her. I also wanted to have the best weather possible. It ended up the bottom paint was cracked and peeling so we needed to remove it all and start from scratch. When we did this we found about 120 blisters - mostly on the port side. I ground these open, left things to dry, then filled them. The repair yard then sanded everything fair and put on a barrier coat in additon to two coats of bottom paint. They also put a small patch on the 'smile' which was really not that bad. 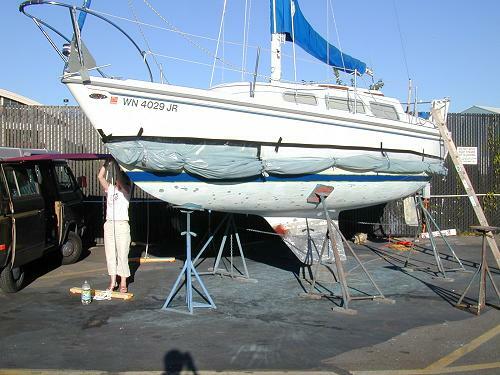 Meanwhile, I replaced all the thru-hulls, painted the boot stripe, and did numerous other repairs. Karen buffed the topsides and we had a boat name made. It was a stressful (and expensive) week but everything turned out ok and we splashed the boat Friday, August 12th - right in time for Tim (a friend from Michigan who flew out to join me for the first week) and I to leave as scheduled. After getting through the locks we spent our first night at the marina in Kingston. 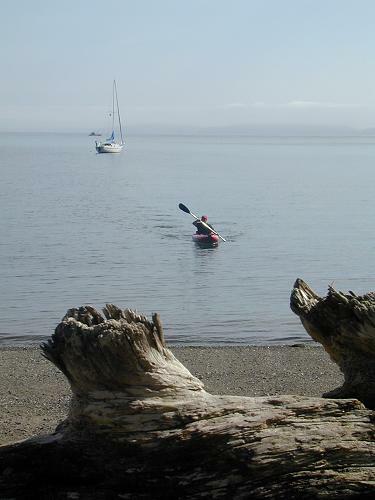 The next day we headed north to Port Townsend. We made good progress with decent wind (rising to almost 20kts near the south end of Morrowstone Island) and arrived around 4pm - with plenty of time to walk into town and check out my friend Mark's brewpub. The next day we awoke early and headed out to cross the Strait of Juan de Fuca - my first major hurdle in the journey north. At times the Strait can kick up some nasty weather. Instead, we found fog. We had a couple of hundred yards of visibility so we headed out figuring we would cross the shipping lanes then skirt up the coast of Whidbey Island. We were listening carefully for the sound of motors and horns as we blew our horn on a regular basis. It was a little unnerving to be so blind in the shipping lanes. However, the GPS told me exactly where we were and I hoped my radar reflector gave off a nice return to all the big ships out there. We came out of the fog near Deception Pass and crossed over Rosario Strait to our first landfall in the San Juan Islands - Watmough Bay on the south end of Lopez Island. It was a somewhat stressful crossing with the fog so it was nice to find this protected little cove with not another boat in sight. We dropped anchor in 15 feet of water, cracked a beer, and inflated the kayaks. 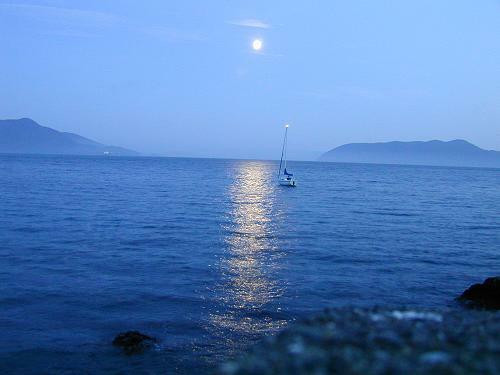 This photo shows Gata Luna on the hook and the nice little beach we had to explore. 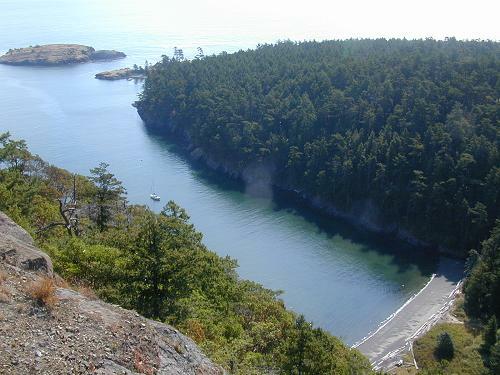 There is a large hill you can hike to the top of for sweeping views of the bay, Rosario Strait and the Strait of Juan de Fuca. Before the trip I purchased two inflatable kayaks from a company called Innova. Deflated they pack very small and even fit in their own little backpack. They were perfect for exploring around the bay and we used them through the rest of the San Juans instead of the dingy. Our next stop north from Lopez was Doe Bay on the east side of Orcas Island. Doe Bay is a former commune that still retains it's liberal leanings. There are cabins, yurts, camping, and (the reason we came) a set of fantastic hot tubs. There was a tub with bubbles, a still tub, a tub with ice cold water, and a sauna. We set the anchor, paddled to shore, and then luxuriated in the tubs with fellow travelers. After a few cycles of hot, cold, sauna, cold shower, hot, etc. we were very relaxed and ready to head back out to the boat. This is a photo of the moon over Gata Luna I took before kayaking back. As you can see this anchorage is open to Rosario Strait so it was a little bumpy that night. After Doe Bay we sailed north to spent a night in Echo Bay on Succia Island. It was a nice harbor and we even got a mooring buoy. It was nice to be moored since a storm kicked up that night. It blew and rained but we were cozy and dry down below. The next stop was Friday Harbor for showers, laundry, groceries, and some R & R.
After Friday Harbor we headed to Roche Harbor on the west side of San Juan Island. This is the luxury resort of marinas in the San Juans. There is a cafe, a nice restaurant, a hotel, and even a lowering of the colors ceremony. 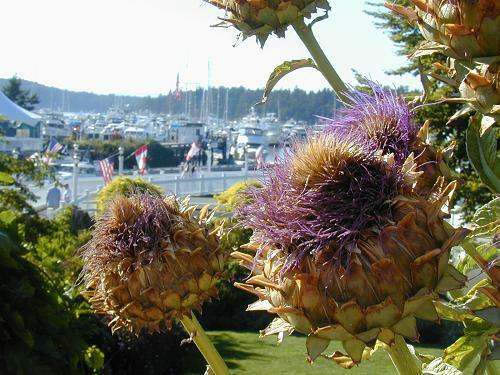 This is a shot of the marina from the extensive flower garden in front of the hotel. At Roche Harbor is an excellent sculpture garden. 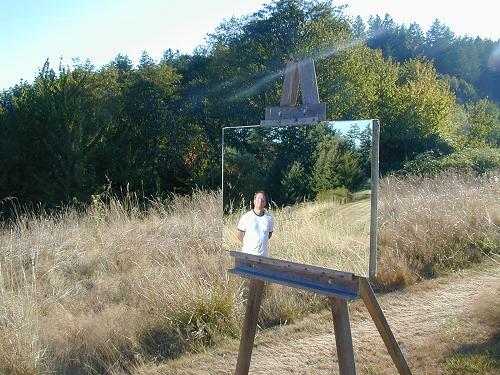 This photo is of one of the sculptures - a mirror on an easel. That's Tim in the background. If you ever get the chance to check this place out, by all means, do it. Another interesting attraction at Roche is the McMillan Mausoleum. Built as a final resting place for his family's ashes, this columned structure is full of meaning. Be sure to pick up a brochure explaining it before you hike out to it. 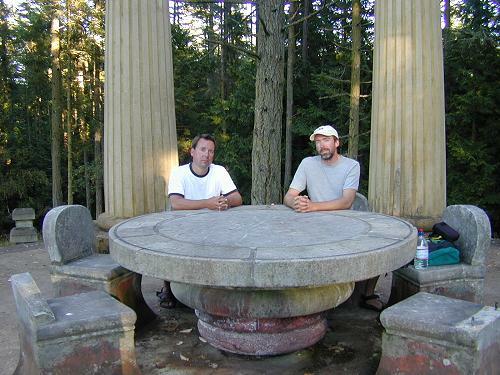 This is a photo of Tim and I sitting at the table in the center. 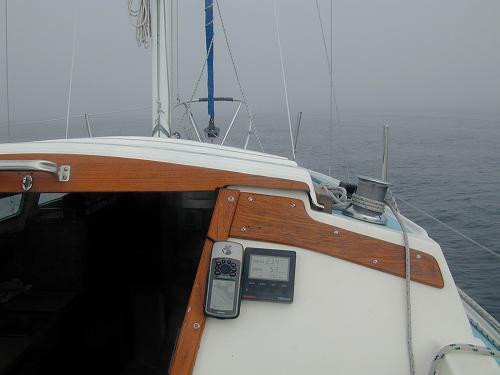 After Roche, we crossed Haro Strait with excellent wind and entered Canadian waters. It was a fight to get through the strong currents near Oak Bay but eventually we came into the harbor at Victoria, B.C. - Gata Luna's first foreign port. We cleared customs with a quick phone call then found a berth in the marina right in front of the Empress hotel, central to the main tourist action. A few hours later Karen arrived on the high speed ferry from Seattle and we had the weekend to dine, walk the city, and shop for things for the boat. It was a vacation from the voyage. Sunday evening, Tim and Karen returned to Seattle on the ferry and I spent time doing chores. 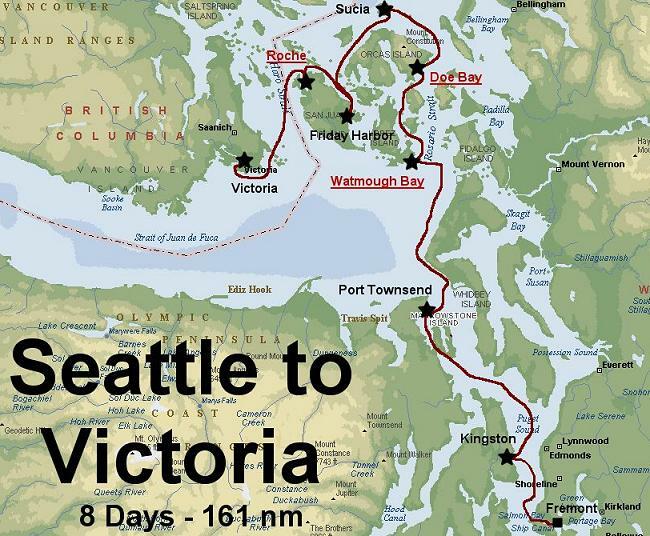 Monday, my friend Craig would arrive and we would continue the trip north through the Gulf Islands. For Tim's take on the trip click here.